The #Hamstrung17 Conference – the “Hamstring Injury Journey”, was held in Melbourne on the 18th of February. The following blog is a recap of the main points from a fantastic day showcasing top speakers and stimulating discussions. Read below the infographic for our take home messages on hamstring injury prevention, and some short interviews with presenters. @andrew_jowett kicked off the conference by reminding us that hamstring injuries are a serious concern in Sports Medicine and account for a whopping 19 % of all injuries in the AFL. Physiotherapist Dr. Anthony Schache then spoke about hamstring injury mechanisms. Hamstring injuries can occur with a variety of different mechanisms, usually involving running, kicking and sprinting and importantly even with submaximal loads. Learn about your athletes – know what they work as, how does this effect injury prevention. Specific conditioning must include biomechanics considerations – how do they run? Is it normal for them? Game awareness and loading drill designs. From our perspective as 2 undergraduates, it was great to hear from the coach’s point of view in a session where we also got a first-hand experience on hamstring injuries as @nathfreeman9 shared his experiences and frustrations being plagued with hamstring issues over a 3 year period. It was a rare chance to hear from our coaching colleagues – this should really be more common in these conferences as they really give you food for thought and challenge you as a clinician. @davidopar then talked about prevention and prediction of injuries. He reminded us that we’re not good at predicting who will get an injury, and that our screening tools are not working. What we can do is tell what has happened in the past, we can tell what is usually associated with injury, but we can’t predict a future injury. His key point was that we need to understand how bad we’re at predicting injuries, so we can start getting better at it. What are the best exercise to prehab of Hamstring injury? There has been a lot of talk about the Nordic Hamstring exercise as the preferred exercise to prevent hamstring injuries. However, it seems that there are a lot of football clubs in Europe that do not follow the training protocol for Nordics, even though the evidence base is positive. 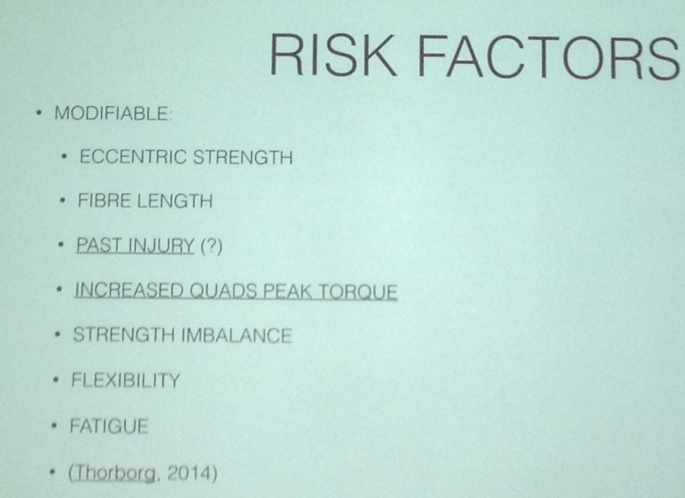 @davidopar touched on this with an interesting slide about the impact of volume with the use of Nordics. Here it seems that it is not about the volume, but more about the duration of time. This could indicate, that you can train Nordics with a shorter amount of volume and get the same results as long as you persist doing it – if this is true, implementation might get easier. But what are the best exercise then? Well… according to @davidopar, there is no best exercise – just because Nordics are the one exercise with the most research doesn’t necessarily make it the best one – and in agreement with the message from Coach Andrew Collins, we should look to individualize the exercise to the individual athlete.